Like most in this world I was not born blind. Similarly, the years of elementary, middle, high school, and undergraduate education, were all filled with clear sight which neither required contact lenses or glasses. However, less than a year after arriving in Tallahassee for graduate school, this would all change. When I arrived at Colorado State University, (CSU) I, like most first year students, was excited and nervous to begin a new chapter in life. The previous years of high school were filled with athletics such as cross country and wrestling, activities like student council, and many high quality relationships. Upon graduating from high school, I felt on top of the world! Not long after this, the transition from high school to college, from home to foreign, from senior to freshman, and from being a big fish in a little pond, to a little fish in a big pond, transitioning from familiar to new people, made my first year at CSU look starkly different than my preconceived ideas. I’m sure many have either heard, or even used this quote; however, I find it to be a bit incorrect. For me, a more accurate version of this quote would be, “Every adversity, every failure, every heartache carries with it the seed of equal or greater benefit…IF YOU LOOK FOR IT. If I don’t actually look for the benefit, many times it remains hidden. I know many people who have dealt with adversity, failure, and heartache, and instead of growing from it, are mired in sorrow, regret, fear, and anger. Unfortunately, this quote can also be used as a balm that good-hearted people say tritely when they don’t know how else to respond to life’s difficulties and unfairness. And most challenging of all is this: It is easy to say to others, but when life has sent bad things to you, it is a much harder pill to swallow. And so begins a journey into my thoughts and feelings as to how I have had to work through tragedy and heartache in my own life. With one of these being the tearful journey I have had to struggle through when my son Aaron, lost his vision to Leber’s Hereditary Optic Neuropathy (LHON). I am a firm believer that one chooses their attitude at all times. (I know…I know…there are chemical conditions that can arise in a person’s brain where they are predisposed to being depressed, or anxious, and that is not some thing that one can “choose” to not have without medical help.) However, I do believe in the quote attributed to Abraham Lincoln, “Folks are usually about as happy as they make up their minds to be.” I also believe that you get what you look for. In other words, if you are looking for bad in the world, you will find it; but if you look for good in the world, you will also find that. It’s kind of like when you buy a new car, and then suddenly you see that same car everywhere. Why? Because suddenly you become aware of that style of car, so your mind notices cars similar to yours, even though before you never saw them and now suddenly you see them everywhere. These quotes all seem simple when one is merely talking “theory”, but when it comes to “real life”, it becomes much more difficult. Little did I know, two-and-a-half years ago, that all this “theory” would come crashing down on me. 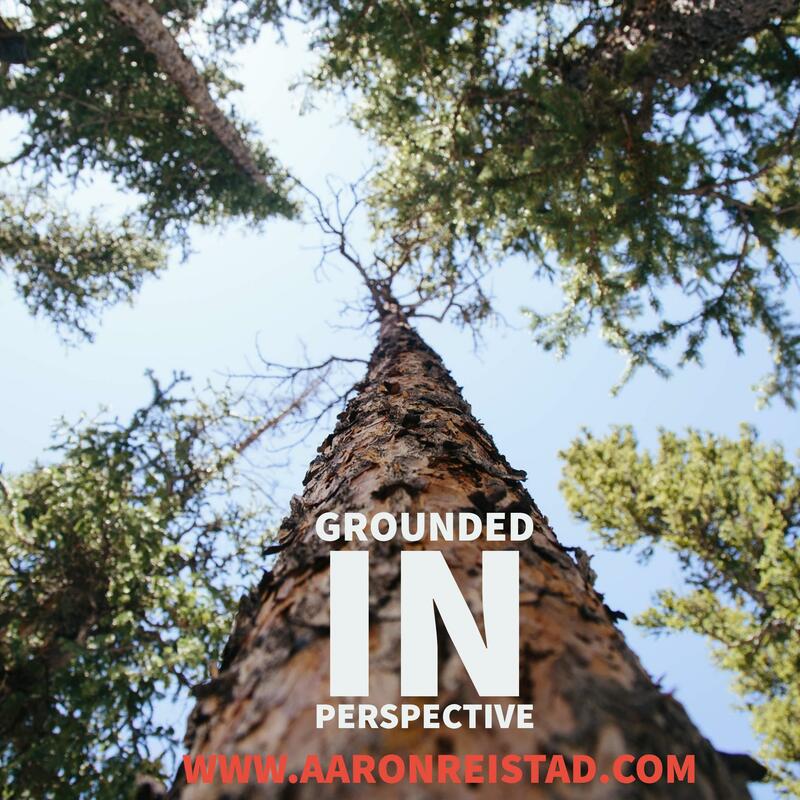 I was forced to find my way out of the darkness that had enveloped me with the news of Aaron losing his sight. When I first began to lose my sight, I wish I would have started connecting my head and my heart on paper. Divulging my feelings, fears, ideas, expectations, and all the other things. I wish I would have been able to capture my raw emotions in the exact moment they presented themselves. I wish I would have been able to convey the difficulty I had wrestling with my blatant, extreme diagnosis. I wish I could have described in detail my fears as my entire life was being flipped upside-down. I wish I could have written these words for you, my reader, but also for myself. I wish I could tell you that I made some sort of conscious decision not to put pen to paper, or that I was busy living life to the fullest, but this is simply not the case. The truth is, I was terrified. 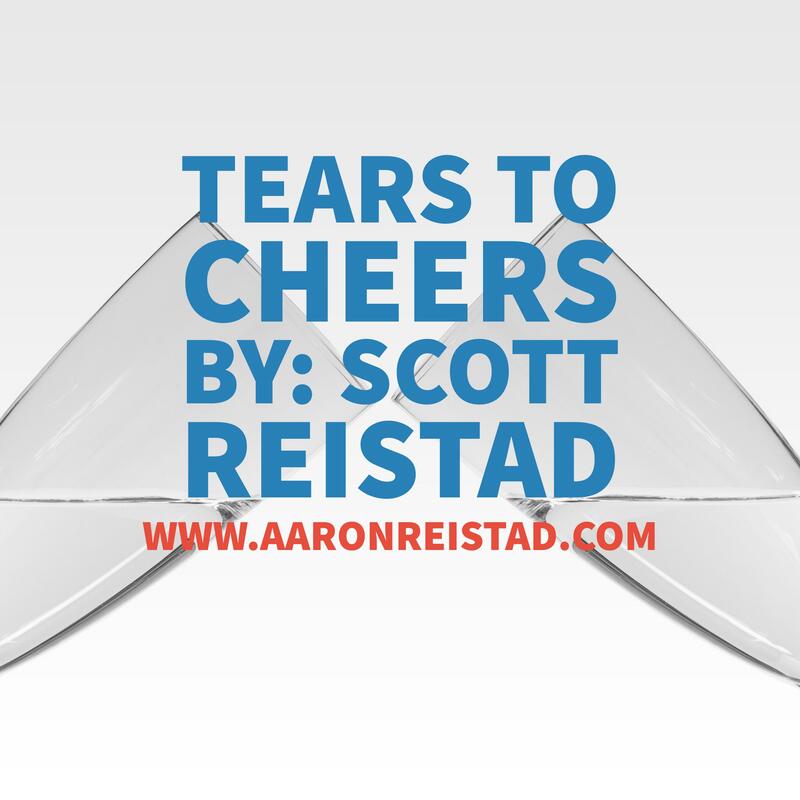 I was nervous to begin dissecting the confusion and sadness of my experience. I was frightened to admit this was my life. I was not prepared to be anything but the physically and emotionally strong man I presented as. I was afraid to identify my own words with the reality of the diagnosis. I was worried that acceptance was my only option. And when it came down to it, I was scared to be scared. I think journaling seemed daunting to me because I felt I was tackling the trauma in small pieces. I wanted relief. I wanted to regain hope, and find some sort of healthy perspective around my distress. I wanted to have the solution to my problems in black and white, with a beginning, middle and end, bound by a hard-cover, and made sense of. A mother’s love is far reaching and intense. She has brought life into this world and will do all in her power to nurture, cherish, and love her creation. She is a mother, and also a daughter, and sometimes a spouse, sister, grandmother, and friend. When my mom’s own mother, and eldest son, both received life changing diagnoses, not only were they affected, so was she. I am proud to be the son of such a strong and loving mother, who has done everything in her power to care for me through the entirety of my life, and especially throughout the loss of my sight. She is both a marvelous mother, and wonderful writer, who has embraced vulnerability by putting pen to paper. Thank you for being my mom and writing this powerful piece. 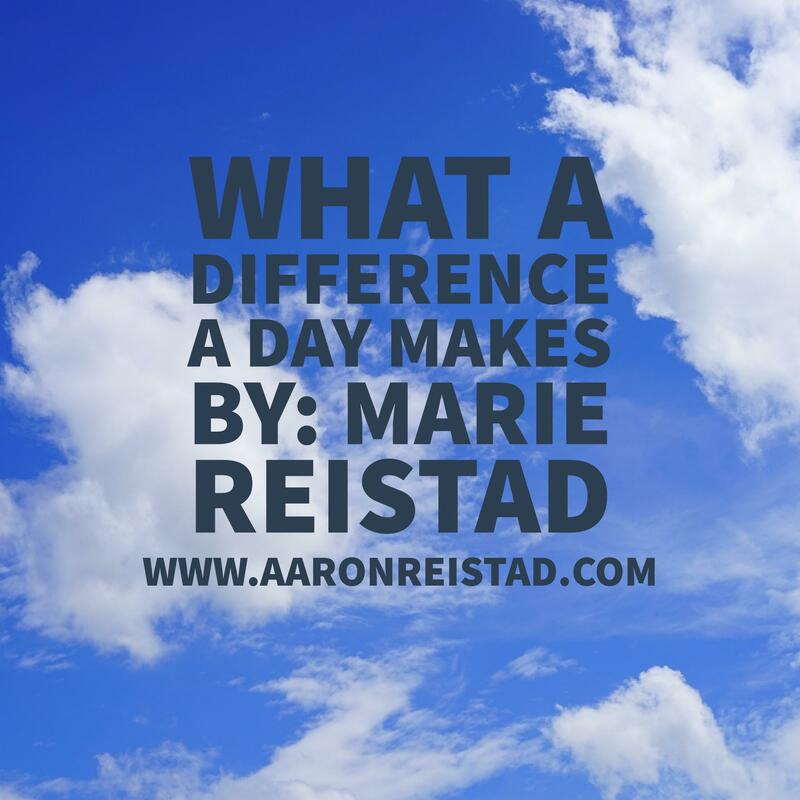 Please take the time to read my mom’s blog, What A Difference A Day Makes,” and get a glimpse into her head, heart, and soul. Throughout my life, there have been defining moments of great joy, and other times where I have been brought to my knees. Some of the joys have been the day I got married and the birth of my 3 boys. One defining moment that brought me to my knees was July 3rd, 2014…a day I will never forget. A medical diagnosis would change my son’s life, my mom’s life and my life, as I knew it. In the spring of 2014 Aaron had told us he was having trouble seeing so we encouraged him to get into an eye doctor, He had always had good vision, and it seemed strange that suddenly he was having issues. After his eye exam, Aaron was told his optic nerve was swollen. After a tapering dose of steroids was unsuccessful in resolving this issue, he was referred to a neurologist who ordered an MRI. In the mean time, I was looking up “swollen optic nerve” online. I discovered many things about it but the ones that scared me the most were a brain tumor or Multiple Sclerosis. As cliché as this saying is, the principal of this message is exceptionally true. Cherishing each and every component of life is not a very common practice in our world today. This is because our frame of reference is limited to personal experience. We take things for granted. For 23 years, I did exactly this. I was guilty of taking for granted the miracle of sight. Today, I do my best to treasure the pieces of life which can be easily overlooked. As surprising as this may be, if there were a way to go back in time and have the opportunity to keep my sight, I would not choose to do so. 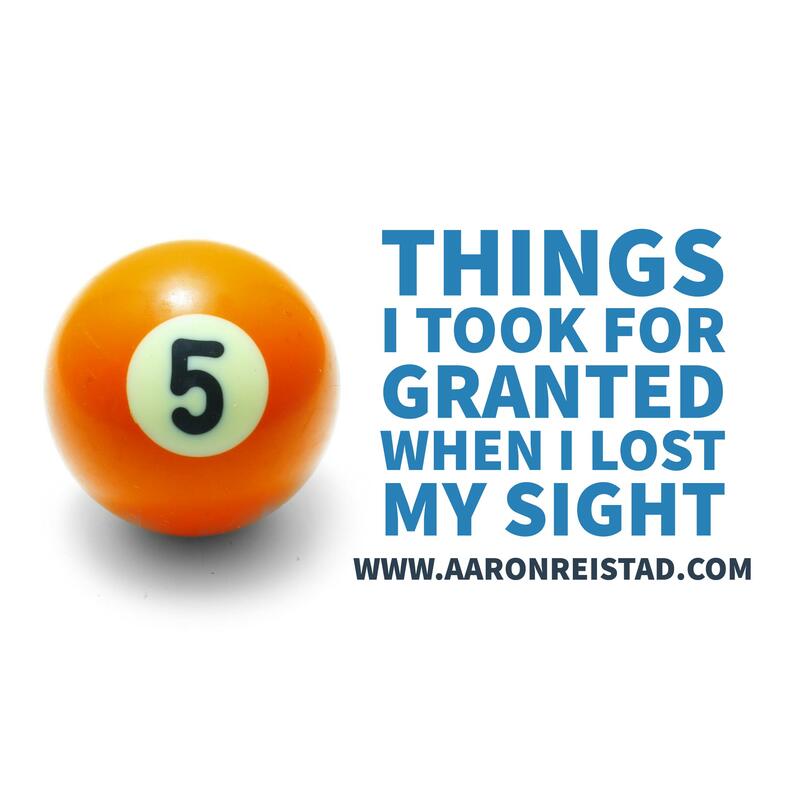 A forthcoming post will be dedicated to providing contrasting insight into the top 5 things I have gained because I lost my sight. Initially, when I was thinking about the things which I took for granted, my mind immediately went to the material objects which have since changed or been forfeited due to my loss of sight. And, more than anything, it is the material things which most people who have not lost their sight immediately jump to when thinking about what must be the hardest part. Sometimes when I tell my story to someone who has their vision, their initial reaction is, “Oh, I am so sorry,” with a tone of sympathy and sadness. I believe this unconsciously stems from the recognition that having full vision is a privilege, and I have had my membership card for this popular privileged social club, where the majority of people spend time together, taken away from me. Privilege is having unearned benefits and advantages afforded to people who fit into a certain social group. For some, having white skin is a privilege, for others being a male is a privilege, and in my first 23 years of life, having full eyesight was a privilege. To me, privilege is the ability to walk into a room, around town, or work and be surrounded by others like you and to be treated equally. I understand that the idea of privilege can be a touchy topic for some, and in the other areas of my identity, I still have a high amount of privilege. I own that. I do miss the days of walking into a social setting and looking around (pun intended) and feeling comfortable because of the subconscious awareness that the others in the room were similar to me. I, like many others, am no longer afforded this luxury. Imagine that all of your closest friends, your family, those you work with, and 99% of the world are all members of the highly popular social club I previously mentioned. Although they know that you are not a part of it, there is nothing they can do to get you a membership card. Also, because not being a part of the social club is so rare, the way in which others interact with you is as though you are a part of the club, because others do not understand that those who are not in the club might interact differently. The intent here is not to shame or guilt trip those who have the privilege of full eyesight. Instead, if you belong to this privileged group, recognizing the comfort and luxuries afforded to those with privilege can be a powerful exercise; and I hope to empower those with privilege to act. You wake up and go to pick out your clothes. You want to wear matching clothes and maybe you have colors or specific clothes in mind but there is no way to tell what is what. Is this your purple or green shirt? Are these your gray or brown pants? How will you tell which is which and if it all matches?. Then you go to get in the shower. You have to know the feel of which bottle is shampoo, conditioner, and body wash and so you have very specific places for each. Then, you go to make breakfast. Is this food expired? What do the instructions on the box say for how long to put it in the microwave? Where is the ingredient you are looking for? Which of these spices is the one you are looking for? If you are cooking with a meat, can you determine when it is done? You are not feeling too hot today so you want to take some DayQuil? but which of the boxes of medicine is it? And once you found the one that feels like it are you sure it is not NyQuil? Finally, you might want to make sure you look presentable, but the mirror is no longer an option so here is hoping for the best. And you have not even left the house. as you can only imagine, the rest of the day follows suit. From being greeted in the hallway by a voice you do not recognize, to being handed a sheet of paper and asked to read it, the world which you are imagining is a reality for many. If you were so emboldened to attempt this challenge, your ability to be creative, problem solve, and adapt were probably at an all-time high. Along with figuring out ways to make it work, I am fully aware of the feelings of exasperation and helplessness which comes with living in a world not designed for you. Although I, and most others who live in a world not designed for us, have figured out ways in which to adapt, there is an emotionally exhausting toll which comes with this on a daily basis. With the constantly advancing technology of the world, coupled with the growing capacity for inclusivity, right now is honestly the best time to be blind. What I mean is, I am able to fully operate my cellphone, go to movies, and even perform all functions of my job because of the advanced and inclusive state of the nation we are in right now. For this I am truly grateful. However, I do miss going to a restaurant and perusing the menu on my own, enjoying apps such as Snapchat, and spending the day in Barnes & Noble reading a variety of books. If you decided to participate in my aforementioned challenge, or even just closed your eyes and tried to imagine the parts of your day which would change, I hope you recognize the gravity of taking the blindfold off, because not all of us are able to. Your face is uniquely beautiful. It can light up a room, express happiness and joy when you see a friend, and speak unspoken pain when you experience sadness. Faces are how you recognize someone, they can be used to gauge one’s mood or tell whether or not someone is listening. Faces are a way to show how the forces of time have evolved your features. They are the reason Skype and FaceTime were invented, and without them, selfies would be obsolete. Through losing my sight, I have become much more perceptive to the way in which people speak. I am more keen to pick up on their tone, word choice, and am truly able to emotionally feel their attitude. My empathy is how I see. Although I have been able to compensate in these ways, I still find myself missing all of the beautiful faces of this world and especially those I am closest to. I have not seen a new face in over two years. To say this has been difficult is an understatement. When I have met new people in these last two years, I usually pair their personality and voice with what I can see of them, (I am not completely blind) and match it with someone’s face I know well. Sometimes, I will ask about their celebrity doppelgänger. This works well enough and some people get a laugh when I show them a picture of who I imagine they look like. But it’s just is not the same. I miss seeing smiles. I miss being able to look at pictures of my loved ones. And I mostly miss being able to make eye contact with someone as we gaze into the windows of each others souls. Whether you are looking in the mirror at your own face, walking around and notice a face you do not know, or looking into the eyes of a loved one, smile because you are seeing. Driving means independence. It allows you the ability to go wherever you want, whenever you want. It provides you with a feeling that I often miss. Oh what I would give to be stuck in traffic! Windows down, and the music of my choice blasting through the speakers. It has been over two years since I’ve opened the driver’s side door, turned the key in the ignition, heard and felt the engine come to life, and experienced control over the steering wheel. These past two years I have had so many wonderful friends who are more than accommodating with assisting me in getting places. I have also grown quite fond of walking places and learned how great and helpful public transportation can be. But, whether it is getting a ride from a friend, waiting for the bus, or using Uber, I am always on someone else’s schedule. More than my car itself, the loss of full independence is one of the hardest things to deal with. So next time you are in your car, sitting in traffic, take a moment to look around and smile; because the road is yours and where and when you are going is up to you. Games have always been something which brought my family together. The bond of playing games allows love, relationships, and connections to grow stronger at the kitchen table where thousands of hours were spent playing hundreds of games. We played it all; board games like Risk, Monopoly, Settlers of Cataan, and card games like Casino, Rage, Hearts, and more. This was a way we spent so much quality time together. My friends and family have been so wonderful with finding games which are easier to play and that you might not need vision for, and for this I am truly grateful. But I do miss the games we used to play and the laughter and love which came with them. Along with this, the way in which I enjoy athletic games has changed. I recently told someone that on the day of a huge football game this Fall, I would instead be attending a concert. This surprised them because they know how passionate I am about athletics. I still enjoy sports, but I would rather enjoy the game from my couch while either listening to the TV or the radio than go to the game itself. Although the atmosphere is still fun, going to games in person does not provide the same entertainment as it used to. So whether you are behind home plate or in the nose bleeds, take a moment to appreciate everything you are seeing. The intention of this post was both to provide information regarding my experiences of living with a visual impairment, and to invoke a sense of appreciation through reflection. These top five are reflective of my lived experience and I do not speak for the rest of this community. You do not know what you have until it is gone is true, but waiting to appreciate something until it is gone does not need to be.